Pre-heat the grill. Brush a baking tray with oil and arrange the frozen fish fillets over the top. Drizzle with oil and season. Cook for 6 minutes on one side, then carefully flip them over. Meanwhile pull out any opened jars such as pesto or herby dressings. Spoon into a bowl and mix in the chopped cherry tomatoes, chopped fresh herb, crushed garlic and capers. 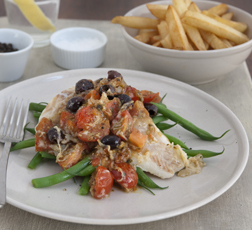 Scatter the salsa over the fish fillets and sprinkle with grated cheese, return to the grill and continue to cook for a further 6 minutes until the fish is cooked through and topping is bubbling.